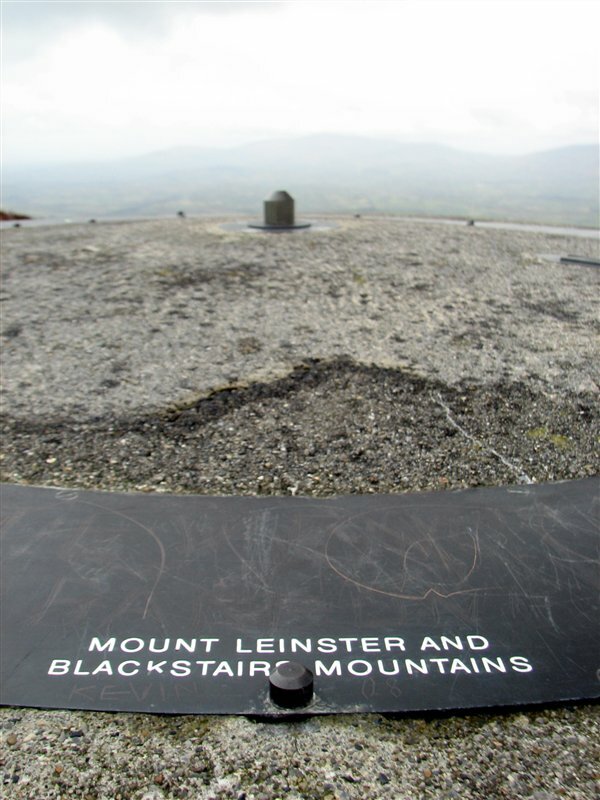 The summit of Brandon Hill is the highest point in Co. Kilkenny. It stands at 515 meters, and felt distinctively wintery on the cold grey day I walked it this week. It may have been spring in the valley, but it was hat and glove weather above. The access road for the route I took takes a bit of finding as it’s a not-too-promising looking dirt track located just over 4km towards Inistioge from the pretty village of Graiguenamanagh. 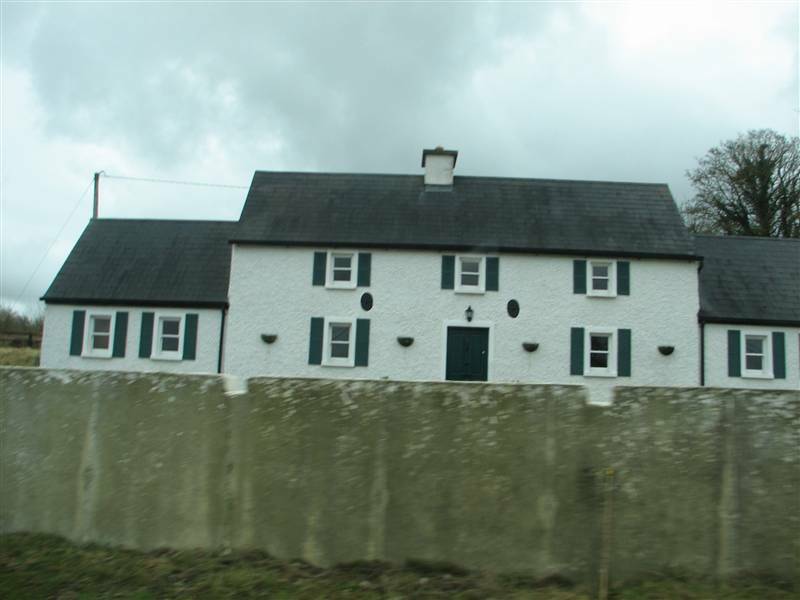 Coming from Graiguenamanagh, turn left at this house! Once you turn onto the track it’s time to start wishing you were in someone elses car or a four-wheel drive, as you are in for three kilometers of rough track that climbs and traverses the hill before terminating in a small parking area. The track is driveable as long as you take your time and your car doesn’t have those side skirt things that make boy racers throughout the land fear passing over traffic calming measures. Having shut up the car and satisfied yourself that the keys aren’t locked inside it, take the level track that leaves the parking area for about two minutes before climbing a fancy stile and following signs for “Brandon Hill Cross”. This path runs around the hill for a kilometer or so before turning uphill for the climb to the top. Once I reached the summit I was greeted with some pretty strong winds and views limited by low flying clouds, which is a pity as the onsite view-o-meter suggests 360 degrees of wonder can be had on clearer days. As well as a large cairn the summit also includes a rusted crucifix which is so grim-looking it actually reminded me that the crucifix was a device of torture. This one is chained in place to protect it from the winds and features crude electrics that suggest anyone touching it might get electrocuted. No doubt it keeps the good christians it overlooks on their best behaviour. A trot back down the hill had me checking my car for burst tires within an hour and a quarter. 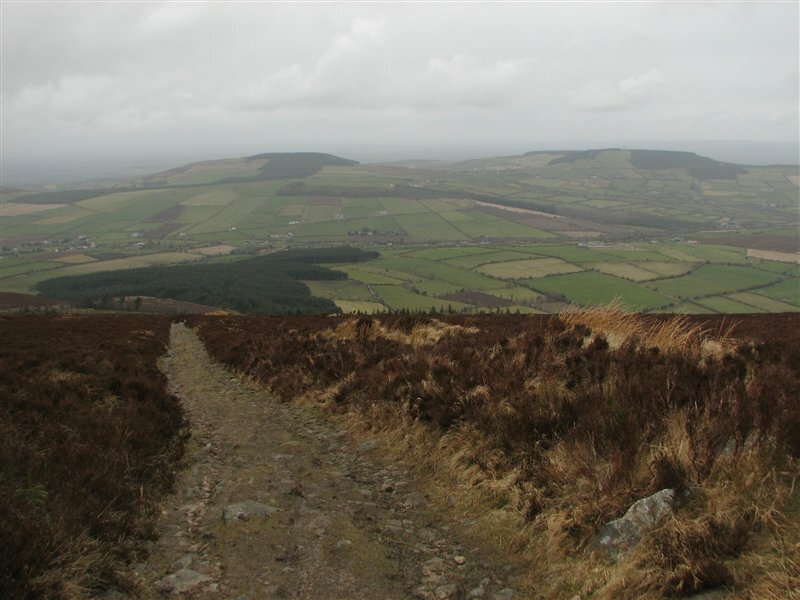 After a hang sangwich I was off to the next hill of the day, Mount Leinster. Great site, just came across it looking for the route up Brandon Hill, gotta say it though – there are another six counties! Errr.. but only 26 highest points shared among them it seems – one should really read more before commenting Duh! Thanks for your comments T! I hope you enjoyed your walk on Brandon Hill. This is a very underated hill, it has little to offer in grim weather but on a clear summer’s day it is a joy, a panorama of the sunny south east. 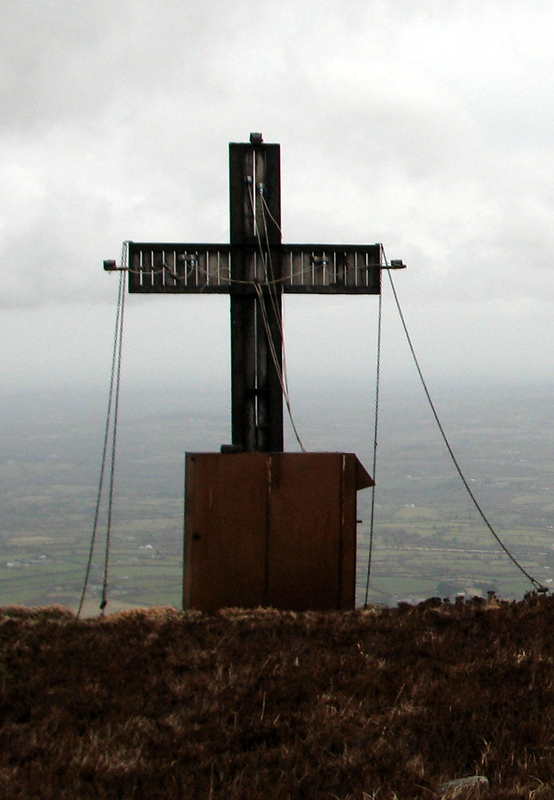 There is a particularly brutal electrocrucifix of doom at the summit but the view is one of the best in Ireland. Opposite for me last week. Fog and -5c setting out from Graigue. Sunny and almost calm on the way up, pealing off the layers. Hi Gerry, judging by your photos of Brandon Hill you certainly had a brilliant day for it…great views across to Mount Leinster. For those who don’t like getting their car shook to pieces via murraynolan’s way, I suggest a 2 mile drive from Graig out the Inistìog Road. At a x-road (watch out on the left for a brown road sign saying”Brandon Hill”. Turn left here, and follow this cul de sac to its end. There is a gate thrown across the lane, so this is where you leave your car. On your left is Brandon and just a few metres away is where you decide which path to take. That’s a great addition to the page. If you happened to have a Google Map of your route I’ll be happy to add it./ add a link to it.